EXTERNAL SPEAKERS - Mentor Radio, LLC. External accessory speaker is durable with a rugged design, featuring a two-toned black and silver face-plate. With 15 watts of input power, this external accessory speaker is perfect for amplifying Uniden Scanners, CB Radios, and other communications receivers. This speaker is a perfect match for your Uniden CB radio or other electronics. It includes a 6 foot speaker wire. 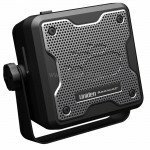 Rugged metal external speaker 12 watt power rating, 8 Ohms impedance and mounting bracket. Presidential style external speaker 10 watt power rating 8 Ohm impedance, includes mounting bracket and 10" cord.